Meet us with Globalis to see how advanced cheque scanners and a modern DMS solution work together. Talk to us about how repetitive automation can help you match hundreds of thousands of invoices, or to reconcile claims, or to reconcile multiple bank accounts. Let us show you how easy it is to drillback from any key field in any application, back to the source doument and all related documents in Filehold. The digital world is already here and what seemed science fiction few years back we now accept as everyday. Voice activated commands on our smear phone now also query our databases and update our dashboards, remote medical checks are done at an atm, artificial intelligence and big data influence our live every time we log onto google, amazon, facebook or ring a callcentre. We have been investigating IoT for over a year, particularly with regard to condition monitoring for asset management and several of our team were involved in recent training that included a hands on session for Microsoft Field Services. This is built on the Dynamics 365 platform as an extension of CRM and offer comprehensive features for field service: help desk, engineer scheduling and mobile operations. Field service is aimed at service companies with a large field force of service engineers and is typically integrated with erp systems and thus the overall project can be quite complex. To reduce the risk and implementation time we offer a proven accelerator. We also offer a Enterprise Asset Management suite which is successfully deployed in several leading UAE companies for a number of years particularly for asset tracking. In Dynamics 365/2012 for Ax EAM also needs to consider that both engineers and equipment may be sued is production or on projects. Thus engineering and maintenance scheduling also has to consider in house planned and breakdown maintenance and servicing and more complex overhauls and asset structures, the impact of equipment downtime on production schedules and much more. We offer a Microsoft certified isv integrated suite of EAM modules built on the Ax 2012/D365 platform that covers both field service and mobile as well as in in house maintenance. Predictive maintenance and SCADA integration and extensive condition monitoring., embedded and Power BI analytics are no longer rocket science. 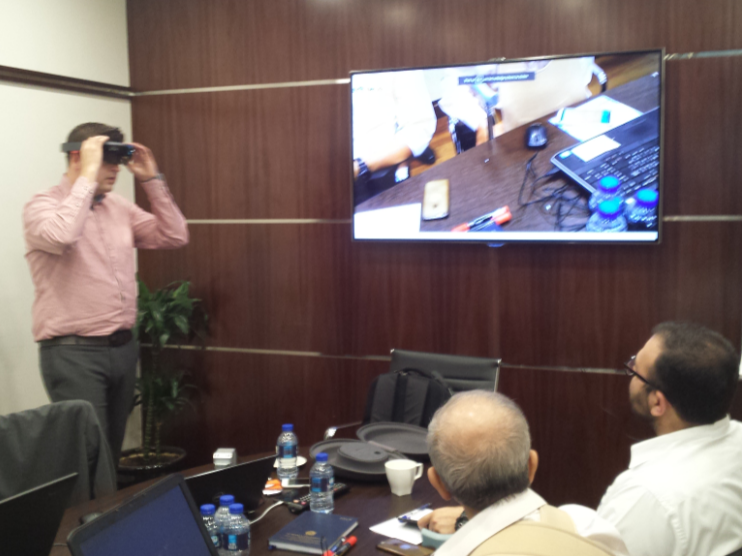 At a recent client 4 day workshop we demonstrated HOLO lens assisted reality to support engineers. This can for example be used to provide step by step guidance or for collaboration from the field with an OEM a remote manufacturer, or your chief engineer. VAT key steps – Synergy Software Systems, Dubai. Account maintenance is now mandatory under UAE VAT Law and it facilitates the correct receipt and payment of cash and other transactions entered by a company. Audited accounts will be needed so don’t wait till year end to find an auditor that suits your business. It is important to change your core processes and adapt your accounting departments to achieve tax compliance. For SMEs, with limited transactions, the task is easier as the transition is less likely to require significant systematic change or they might use an external bookkeeper or tax agent. Employees need proper insight around GCC-wide initiatives to implement VAT across the region and how companies should prepare. Help them de-mystify VAT by providing on the job training and a framework to raise and clarify queries. Avoid disputes with trading partners and ensure staff have the relevant information and training to resolve issues that arise. Many businesses negotiated contracts at a time VAT was not payable but running across the implementation dates. It is time to now bring contracts into step with the UAE’s economic context. Electronic reporting systems are increasingly being used by tax authorities. The ability to produce the required audit file details on demand will be difficult without a system. Companies that use electronic invoicing are likely to improve the timing of VAT recovery on costs. Register your company to avoid a fine as severe as AED 20,000. The Federal Tax Authority (FTA) has already been extend the deadline to the 1st January and if you don’t complete VAT registrations you will also have to stop sales till you get your tax registration certificate (TRC). Note initial returns are due 28 January 2018 so time is running out. The implementation of taxes in the UAE came with a whole new set of procedures. we recommend to study and get familiar with the different laws in place including the UAE VAT Law and to discuss with your auditor, tax agent and software provider. There have been a slew of clarifications in the last month and some details are still not finalised e.g. with regard to free zones, or which companies will report monthly and which quarterly. The UAE Federal Tax Authority (FTA) online portal is open 24/7 to allow for taxpayers to register for VAT purposes. The FTA has also determined the deadlines for the application for VAT registration based on business turnover. Businesses that are required to register for VAT will need to set up an online account on the FTA website and complete the VAT registration form. Prior to the fulfilment of the VAT registration form, the FTA provides a “Getting Started Guide” that shares essential information that businesses should be aware of. This includes information on the registration criteria, registration of a VAT group, and necessity to register if only zero-rated supplies are made. taxpayer to ensure accurate tax compliance. as required (for instance VAT Grouping). Businesses should allow time to compile the required information for the VAT registration. You never know when some item that queries or alters data in SQL Server will cause issues. Finally, unlike traditional malware or attacks, the user does not have to click on a link or download a questionable file. No action by the user is necessary to enable the attack. The Securities and Exchange Commission said Wednesday that a cyber breach of a filing system it uses may have provided the basis for some illegal trading in 2016. In a statement posted on the SEC’s website, Chairman Jay Clayton said a review of the agency’s cybersecurity risk profile determined that the previously detected “incident” was caused by “a software vulnerability” in its EDGAR filing system (which processes over 1.7 million electronic filings in any given year.) The agency also discovered instances in which its personnel used private, unsecured email accounts to transmit confidential information. So let me suggest take a good look at your systems and be honest – do you feel safe? Microsoft has released Microsoft 365, a complete, intelligent solution, including Office 365, Windows 10, and Enterprise Mobility + Security, that empowers everyone to be creative and work together, securely. Watch Satya introduce it. Although acts of vandalism such as defacing corporate websites are still commonplace, hackers prefer to gain access to the sensitive data residing on the database server and then to sell the data. measures including fines and damages to be paid to victims. • Web and database servers. Information about such exploits are readily available on the Internet, and many have been reported on this blog previously. So no surprise that Web security should contain two important components: web and database server security, and web application security. Addressing web application security is as critical as addressing server security. communicate with your web and databases servers (i.e. over port 80). accessed through specific ports and so anyone can attempt direct connections to the databases to try and bypass the security mechanisms used by the operating system. These ports remain open to allow communication with legitimate traffic and therefore constitute a major vulnerability. be used even though the web and database servers contain no vulnerability themselves. GDPR Affects All European Businesses – What about the G.C.C. and U.A.E.? See our previous article on this topic for why your company may be affected if you are a branch of a European company, or have branches in Europe, or trade with a European company. The penalties set for breaches of GDPR are up to 4% of a company’s annual global turnover. For large companies like Microsoft that have operations within the EU, making sure that IT systems do not contravene GDPR is critical. As we saw on August 3, even the largest software operations like Office 365 can have a data breach. That means that individuals have the right to ask companies to tell them what of their personal data a company holds, and to correct errors in their personal data, or to erase that data completely. - and notify authorities when data breaches occur. On first reading, this might sound like what companies do – or at least try to do – today. The difference lies in the strength of the regulation and the weight of the penalties should anything go wrong. The definitions used by GDPR are broad. To move from the theoretical to the real world an organization first needs to understand what personal data it currently holds for its business operations, and where they use the data within software applications. • Annual reviews written about employees stored in a SharePoint or OneDrive for Business site. • A list of applicants for a position in an Excel worksheet attached to an email message. • Tables holding data (names, employee numbers, hire dates, salaries) about employees in SharePoint sites. Other examples might include contract documentation, project files that includes someone’s personal information, and so on. What backups do you have of the customer’s data? What business data do your staff hold on BYOD devices e.g. in What’s App? • Classification labels and policies to mark content that holds personal data. • Auto-label policies to find and classify personal data as defined by GDPR. Retention processing can then remove items stamped with the GDPR label from mailboxes and sites after a defined period, perhaps after going through a manual disposition process. • Content searches to find personal data marked as coming under the scope of GDPR. 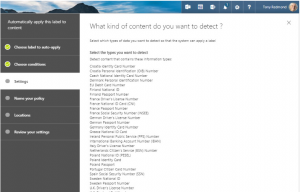 • Alert policies to detect actions that might be violations of the GDPR such as someone downloading multiple documents over a brief period from a SharePoint site that holds confidential documentation. • Searches of the Office 365 audit log to discover and report potential GDPR issues. 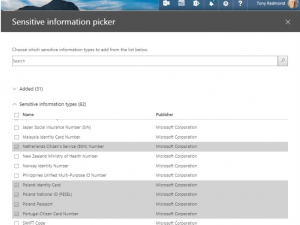 • Azure Information Protection labels to encrypt documents and spreadsheets holding personal data by applying RMS templates so that unauthorized parties cannot read the documents even if they leak outside the organization. Technology that exists today within Office 365 that can help with GDPR. Create a classification label to mark personal data coming under the scope of GDPR and then apply that label to relevant content. 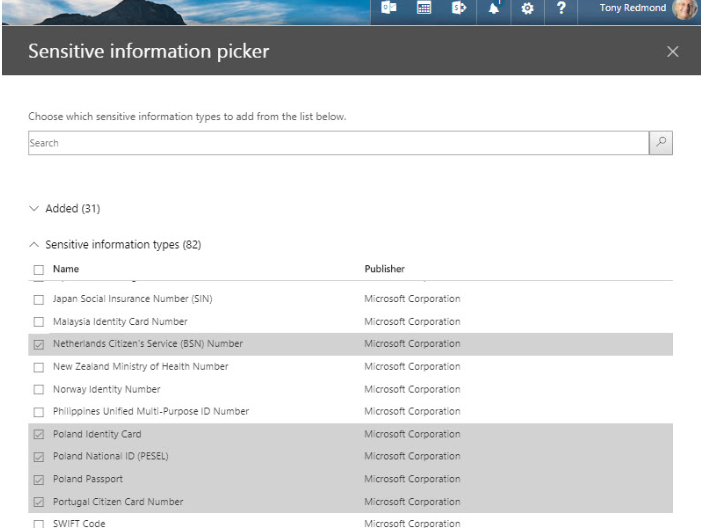 When you have Office 365 E5 licenses, create an auto-label policy to stamp the label on content in Exchange, SharePoint, and OneDrive for Business found because documents and messages hold sensitive data types known to Office 365. Select from the set of sensitive data types available in Office 365. The set is growing steadily as Microsoft adds new definitions. At the time of writing, 82 types are available, 31 of which are obvious candidates to use in a policy because those are for sensitive data types such as country-specific identity cards or passports. The screenshot in Figure 2 shows a set of sensitive data types selected for the policy. The policy applies a label called “GDPR personal data” to any content found in the selected locations that matches any of the 31 data types. Auto-apply policies can cover all Exchange mailboxes and SharePoint and OneDrive for Business sites in a tenant – or a selected sub-set of these locations. Use classification labels to mark GDPR content so that you can search for this content using the ComplianceTag keyword (for instance, ComplianceTag:”GDPR personal data”). It may take 1-2 week before auto-label policies apply to all locations. An auto-label policy will not overwrite a label that already exists on an item. Microsoft plans to expand the Office 365 data governance framework to other locations (applications) over time. What about all the applications running on SQL or other databases? Master Data Management MDM is a feature of SQL since SQL 2012. However, when you have many data sources then you are relay into an ETL process and even with MDM tools the work is still significant. If you have extensive requirements then ask us about Profisee our specialist, productized MDM solution built on top of SQL MDM that allows you to do much of the work by configuration. Finding GDPR data is only part of the problem. Article 17 of GDPR (the “right of erasure”), says: “The data subject shall have the right to obtain from the controller the erasure of personal data concerning him or her without undue delay.” In other words, someone has the right to demand that an organization should erase any of their personal data that exists within the company’s records. Content searches can find information about someone using their name, employee number, or other identifiers as search keywords, but erasing the information is something that probably also needs manual processing to ensure that the tenant removes the right data, and only that data. You can find and remove documents and other items that hold someone’s name or other identifier belonging to them by using tools such as Exchange’s v Search-Mailbox cmdlet, or Office 365 content searches. What if the the data ahs to be retained because the company needs to keep items for regulatory or legal purposes, can you then go ahead and remove the items? The purpose of placing content on-hold is to ensure that no-one, including administrators, can remove that information from Exchange or SharePoint. The GDPR requirement to erase data on request means that administrators might have to release holds placed on Exchange, SharePoint, and OneDrive for Business locations to remove the specified data. Once you release a hold, you weaken the argument that held data is immutable. The danger exists that background processes or users can then either remove or edit previously-held data and so undermine a company’s data governance strategy. The strict reading of GDPR is that organizations must process requests to erase personal data upon request. What if the company needs to keep some of the data to satisfy regulations governing financial transactions, taxation, employment claims, or other interactions? This is a dilemma for IT. Lawyers will undoubtedly have to interpret requests and understand the consequences before making decisions and it is likely that judges will have to decide some test cases in different jurisdictions before full clarity exists. Microsoft is working to help Office 365 tenants with GDPR. However, I don’t see the same effort going to help on-premises customers. Some documentation exists to deal with certain circumstances (like how to remove messages held in Recoverable Items), but it seems that on-premises customers have to figure out a lot things for themselves. This is understandable. Each on-premises deployment differs slightly and exists inside specific IT environments. Compared to the certainty of Office 365, developing software for on-premises deployment must accommodate the vertical and company specific requirements with integrations and bespoke developments. On-premises software is more flexible, but it is also more complicated. Solutions to help on-premises customers deal with GDPR are more of a challenge than Microsoft or other software vendors wants to take on especially given the industry focus of moving everything to the cloud. Solutions like auto-label policies are unavailable for on-premises servers. Those running on-premises SharePoint and Exchange systems must find their own ways to help the businesses that they serve deal with personal data in a manner that respects GDPR. Easier said than done and needs to start sooner than later. If you work with SharePoint Online, you might be interested in the SharePoint GDPR Activity Hub. At present, work is only starting, but it is a nway to share information and code with similarly-liked people. There many ISV-sponsored white papers on GDPR and how their technology can help companies cope with the new regulations. There is no doubt that these white papers are valuable, if only for the introduction and commentary by experts that the papers usually feature. But before you resort to an expensive investment, ask yourself whether the functionality available in Office 365 or SQL is enough. GDPR will effect Office 365 because it will make any organization operating in the European Union aware of new responsibilities to protect personal data. Deploy Office 365 features to support users in their work, but do not expect Office 365 to be a silver bullet for GDPR. Technology seldom solves problems on its own. The nature of regulations like GDPR is that training and preparation are as important if not more important than technology to ensure that users recognize and properly deal with personal data in their day-to-day activities. Any taxable person must retain VAT invoices issued and received for a minimum of 5 years. The place of supply will determine whether a supply is made within the UAE (in which case the UAE VAT law will apply), or outside the UAE for VAT purposes. For a supply of goods, the place of supply should be the location of goods when the supply takes place – with special rules for certain categories of supplies (e.g. water and energy, cross border supplies). For the supply of services, the place of supply should be where the supplier is established – (with special rules for certain categories of supplies e.g. cross border supplies between businesses). VAT shall be payable in addition to the custom duties paid by the importer of the goods and cannot be deducted against. VAT shall be computed on the value that includes the customs duties. Some goods that are imported may be exempt from customs duties but be subject to VAT. VAT is due on the goods and services purchased from abroad. In case the recipient in the State is a registered person with the Federal Tax Authority for VAT purposes, the VAT would be due on that import using a reverse charge mechanism. In case the recipient in the State is a non-registered person for VAT purposes, VAT would be paid on import of goods from a place outside the GCC. Such VAT will typically be required to be paid before the goods are released to the person. - The VAT treatment of real estate will depend on whether it is a commercial or residential property. Supplies (including sales or leases) of commercial properties will be taxable at the standard VAT rate (i.e 5%). - Supplies of residential properties will generally be exempt from VAT to ensure that VAT does not constitute an irrecoverable cost to persons who buy their own properties. To ensure that real estate developers can recover VAT on construction of residential properties, the first supply of residential properties within 3 years from their completion will be zero-rated. There is a difference between exempt goods and zero rate. (for example zero rate might be raised in future). • Supply of certain Healthcare services, and supply of relevant goods and services. It is expected that fee based financial services will be taxed but margin based products are likely to be exempt. Generally, insurance (vehicle, medical, etc) will be taxable. Businesses that meet requirements the Legislation (such as being resident in the UAE and being related/associated parties) will be able to register as a VAT group. For some businesses, VAT grouping will be a useful tool to simplify accounting for VAT. VAT registered businesses will be able to reduce their output tax liability by the amount of VAT that relates to bad debt which has been written off by the VAT registered business. The legislation will include the conditions and limitations concerning the use of this relief. A scheme will be introduced to allow a UAE national who is not registered for VAT to reclaim VAT paid on goods and services relating to constructing a new residence which will be privately used by the person and his family. This will allow the recovery of VAT on such expenses as contractor’s services and building materials. To avoid double taxation (where second hand goods are acquired by a registered person from an unregistered person for the purpose of resale), the VAT-registered person will be able to account for VAT on sales of second hand goods with reference to: the difference between the purchase price of the goods, and the selling price of the goods (that is, the profit margin). The VAT which must be accounted for by the registered person, will be included in the profit margin. The legislation will include the details of the conditions to be met in order to apply this mechanism. A VAT registered person incurs input tax on its business expenses, and this input tax can be recovered in full when it relates to a taxable supply that was made, or intended to be made, by the registered person. In contrast, where the expense relates to a non-taxable supply (e.g. exempt supplies), then the registered person may not recover the input tax paid. VAT will not be deductible in respect of expenses incurred for making non-taxable supplies. Furthermore, input tax cannot be deducted when it is incurred in respect of specific expenses such as entertainment expenses e.g. for employee entertainment. • The business must be a taxable person (the end consumer cannot claim any input tax refund). • VAT should have been charged correctly (i.e. unduly charged VAT is not recoverable). • The business must hold documentation showing the VAT paid (e.g. valid tax invoice). • The goods or services acquired are used or intended to be used for making taxable supplies. • VAT input tax refund can be claimed only on the amount paid or intended to be paid before the expiration of 6 months after the agreed date for the payment of the supply. In certain situations, an expense may relate to both taxable and non-taxable supplies made by the registered person (such as activities of the banking sector). In these circumstances, the registered person would need to apportion input tax between the taxable and non-taxable (exempt) supplies. Businesses will be expected to use input tax (ratio of recoverable to total) as a basis for apportionment in the first instance – (there will be the facility to use other methods where those are fair and agreed with the Federal Tax Authority). • Tax evasion offences where a person performs a deliberate act or omission with the intention of violating the provisions of the issued tax legislation. No special rules are planned for small or medium sized enterprises. The FTA will provide materials and resources available for these entities to assist them in their enquiries. A supplier registered or required to be registered for VAT must issue a valid VAT invoice for the supply. To be considered as a valid VAT invoice, the document must follow a specific format as mentioned in the legislation. In certain situations the supplier may be able to issue a simplified VAT invoice. Supplies made by government entities will typically be subject to VAT. This will ensure that government entities are not unfairly advantaged as compared to private businesses. Certain supplies made by government entities will, however, be excluded from the scope of VAT if they are not in competition with the private sector or where the entity is the sole provider of such supplies. It is likely certain government entities will be entitled to VAT refunds – this is designed to avoid budgeting issues and provide a level playing field between outsourced and insourced activities. For the supplies provided for government entities, the treatment of such supplies shall depend on the same supply and not on the recipient of the supply. Therefore, if the supply is subject to the standard tax rate, the treatment would remain the same even if it is provided to a government entity. • Where a payment is received in respect of a supply of goods before the introduction of VAT, but the goods are actually delivered after the introduction of VAT. This means that VAT will have to be charged on such supplies. Likewise, special rules will apply with regards to supplies of services spanning the introduction of VAT. • Where a contract is concluded prior to the introduction of VAT in respect of a supply, which is wholly or partly made after the introduction of VAT, and the contract does not contain clauses relating to the VAT treatment of the supply, then consideration for the supply will be treated as inclusive of VAT. There will, however, be special provisions to allow suppliers to charge VAT in situations where their recipient is able to recover their VAT but where there is no VAT clause. Note that VAT will be payable in full not after netting off input tax which will then have to be claimed. This is more of a challenge for cash flow and business risk, especially given the penalties for late payments. Refunds will be made after the receipt of the application and will be subject to verification checks, with a particular focus to avoid fraud. The FTA may provide its views on various matters in the law. Taxpayers may choose to challenge these views. However, penalties may be imposed on taxpayers who are found to violate any tax laws and regulations. It is expected that businesses will need to complete additional information on their VAT returns to report revenues earned in each Emirate. Guidance will be provided to businesses with regards to this. It is expected that the rules will be relatively straightforward for most businesses and will be based, for example, for B2C transactions, on the location of the transaction (e.g. in a retail environment, the location of the shop). European Union General Data Protection Regulation (GDPR) – 2018 what should GCC countries consider? The UAE Ministry of Economy is raising awareness among private sector companies of the need to be ready for new European data protection rules, which comes into force one year from now. The European Union General Data Protection Regulation (GDPR) is set to become law by May 2018. The new rules govern all companies in Europe, as well as all companies trading with European companies and individuals. The law includes strong penalties for either misuse of data, or failure to protect the personal data of customers, with fines of up to 4% of annual turnover, or 20m euros ($22m). HE Juma Mohammed Al Kait, Assistant Undersecretary for Foreign Trade at the Ministry of Economy, noted that the regulation issued by the EU aims to protect the data of every individual in the EU. This not only impacts companies operating in European countries, but includes all institutions and companies that conduct business, trade and investment activities within EU countries, including the UAE business sector linked with European trade relations. Due to this, the Ministry is working on deepening its knowledge about the new legislation, its provisions and requirements, and aims to reconcile its operational procedures with European authorities, in adherence with the framework of the GDPR, before May 2018. Al Kait emphasized the EU is one of the UAE’s most important trade partners. Trade between the two sides generated $65.8 billion in 2016 alone. The UAE has become one of the top 10 destinations for EU exports, and is home to over 41,000 European companies, in addition to over 121,000 EU citizens. Penalties will also apply to information controllers and processors, including cloud software companies. The new legislation also outlines terms of approval for the use of data, to prevent companies from using legally illegitimate terms, and gives both parties the ability to easily withdraw if desired. 3.neither have a physical presence in the EU nor offer goods or services to people in the EU, but monitor the online behavior of data subjects in the EU, will have to ensure that they are complying with the European Union General Data Protection Regulation (“GDPR”). Based on the test set out in the GDPR, the new regulations will likely apply to a significant number of entities in this region. - regional banks and other financial service companies that have branches in the financial centres in the EU and online. - mobile apps that can be downloaded by users in the EU and which have access to a user’s contacts, photos or location data. All of these businesses may need to comply with the GDPR and to mitigate the risk and cost of failure to do so. 3. take immediate steps to prepare to comply with the GDPR . For option (2), if your organization does not have an establishment in the EU and does not need to target or monitor EU data subjects then you ight consider making it very clear that your website or app is not for use by EU users (e.g. including geo-blocking EU data subjects). for option (3), if you have not started the process of ensuring compliance by now, then there is a lot to do. The need for compliance, especially for longer-term projects such as records of processing and compliant contracting, must be addressed as soon as is practicable. • Audit: to identify key remediation areas. • Record of Processing: This mandatory record will require significant internal resources, but will also help to plan and implement GDPR processes. .
• Consider Contract Renegotiations: The GDPR requires that contracts with data controllers include additional obligations. As companies come to renegotiate contracts, ensure that adequate data protection clauses are added. • Review and update, where necessary, employee notices to be GDPR compliant. If you currently conduct criminal records checks, then review national laws where you operate to ensure you can continue to do so . There is an emphasis on transparency in the GDPR. Notices must be clear, concise and informative. Employees must be adequately informed of all data processing activities and data transfers and the information set out in Articles 13 to 14 must be provided. Criminal records can no longer be processed unless authorized by member state law. in the current Data Privacy Directive, the GDPR imposes new requirements to gain valid consent. Consent can be withdrawn at any time and systems must be able to handle withdrawal request. from 13 to 16 years old depending on the member state. • Data privacy rights. The current rights to request access to data or require it to be rectified or deleted have been expanded to include a much broader right to require deletion (“the right to be forgotten”), a right not just to access your data but have it provided to you in a machine readable format (“data portability”). Versions of the existing right to object to any processing undertaken on the basis of legitimate interests or for direct marketing and the right not to be subject to decision based on automated processing are also included and expressly refer a right to object to profiling. Consider what data you hold in emails, in CRM systems, Social media. What should be your data access use and retention policies? Personally I think it will be great if this is a way to prosecute the perpetrators of all the spam nd phishing emails I get or at least to remove data form their lists! VAT (Value Added TAX), which is also called as ‘tax on consumption’ , is a tax that is payable while purchasing any product. VAT is applied as particular percentage of the cost of goods and services, hence it can not be considered as a charge on companies. It is a general tax amount, which is added by the producer to the inputs before they are sold as new offerings. All UAE businesses subject to the Value-Added Tax have to submit their tax declaration statements on a quarterly basis after the VAT law goes into effect starting January 2018, according the Ministry of Finance. The threshold for VAT registration put at Dh375,000 as per the ministry’s announcement this week. It is optional to register between Dh187,500 and Dh375,000 . UAE businesses will be able to start VAT registration in Q3 2017 and it is compulsory to be registered by Q4 2017. Businesses will be able to register online using eServices. The UAE businesses, subject to the tax, have to keep all files that allow competent authorities to audit their transactions and commercial activities, with the nature of the needed documents to be announced over the coming period. Businesses will be required to keep records which will enable the authorities to identify the details of the business activities and to review transactions. The specifics regarding the documents which will be required and the time period for keeping those will be communicated in due course. Review your finance systems’ readiness for rapid implementation to meet these requirements. There will be a shortage of skilled consultants, and there are several holidays (EID, Diwali, Christmas, New Year, National Day etc. its also budget time, and preparation for year end audits,to fit in during the last quarter. Allow time for collection of your trading partners VAT registration ids, for report development and update, for testing and for staff training. All six of the GCC member states: Saudi Arabia, Qatar, Oman, Kuwait, the UAE and Bahrain – have now signed and approved the VAT framework. Registered businesses will be expected to submit VAT returns on a regular basis. It is expected that the default period for filing VAT returns will be three months for the majority of businesses. Registered businesses will be able to file their returns online using eServices. Health, education services, international transportation, import gold for investment purposes, commodities and exports are exempted from VAT in UAE. Residential buildings for sale or lease during the first three years in which the building is completed, some financial services and empty plots of land are also exempted from VAT. The GCC Member States will appreciate the VAT on financial provisions. The Banks and Financial House are ineligible for VAT in terms of the services provided, instead, they might be eligible for input tax based on tax recovery rates determined by each Member State. The Federal Tax Authority has also announced a 100 per cent tax on tobacco, energy drinks and 50 per cent on carbonated beverages. This is separate from VAT. The General Authority for Zakat and Income Tax (GAZT) in KSA reportedly warned businesses, during an awareness session that took place at the Riyadh Chamber of Commerce on Monday 16 May 2017, that penalties will be applicable in the cases of violation of VAT laws and regulations. • Case 1: Businesses required to register for VAT and that fail to register shall be liable to double the net tax due. • Case 2: Committing an error in filling the tax return shall result in paying an additional 50% of net tax declared. • Case 3: Exaggerated tax refund claims shall be subject to a penalty 50% of the original amount reported. • Case 4: Late filing of tax return would result in a penalty of SAR 1,000 and an extra 5 to 20% of the unpaid tax. The percentage varies depending on the number of days of delay. • Case 5: Non-registered person who issue an invoice with VAT shall pay SAR 1,000 or double the amount of the net tax (whichever is higher). • Case 6: Not keeping records of the required documents shall result on a penalty of SAR 1,000 or 2% of the monthly average taxable supplies (whichever is higher). • Case 7: Non-compliance with GAZT inquiries in providing relevant information shall result in a penalty of SRA 1,000 or 2% of the average monthly taxable supplies (SAR 20,000 maximum) or whichever is higher. Saudi Ministry of Finance on their website. states discretion on how to treat others. Once the agreement is ratified, each member state can issue its own local law and implement VAT. The UAE intends to implement VAT with effect from 1 January 2018 but other states may take another 6 months or so. The framework paves the way for implementation, for a basic rate of VAT of five percent with certain supplies of goods and services zero rated or VAT exempt. We understand that the Ministry of Finance (MoF) will release the UAE’s law on VAT towards the end of June. This will detail how the UAE will interpret the GCC framework and how it will deal with those matters where it has discretion. These will include whether to treat certain supplies as zero rated or VAT exempt. There is no indication of how VAT will apply to free zones. The framework provides information to start planning for VAT. VAT will impact all businesses in the UAE, either directly or indirectly. So carefully review your systems and review their processes to understand the impact of VAT and to determine what needs to be done to be fully compliant with the new laws. Do you need to recruit? Train? Budget for auditors, or consulting support, or system modifications or upgrades? What contracts are in place beyond 1 January 2018 -how will those be impacted by VAT? documentation will be essential to support a VAT refund claim and avoid penalties for non-compliance. - hold VAT codes by item fro the relevant tax rate or exemption. – or other special VAT treatments on particular transactions. - work with current interfaces. We have already received several dozen inquires to assist with this transition, if you need assistance with your business systems to comply with VAT then please contact us in good time – year end is a holiday season and also a busy time for new system go live, and for financial audit preparation. 3 new Microsoft tools to help you to move to the cloud. Here’s a breakdown of the three new Microsoft tools to help you move to the cloud faster and what they can offer businesses. This assessment will help customers to more easily find and to better understand their current server setups, to help them to determine the cost and the value of moving to the cloud. Once the servers are discovered, the tool can analyze their configurations, and give the user a report of the potential cost drop of moving to Azure. Data center administrators can export the results of the assessment into a customized report. The report could provide some valuable data and statistics for a CIO conversation with the CFO. 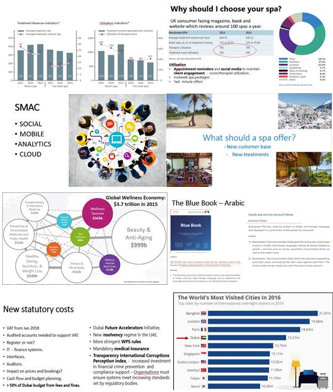 - What are the challenges an opportunities for the spa industry in the U.A.E. ? - Hear from industry professionals. - Find out how Core from Premier Software and Deyafa Systems can help you increase you inquiry conversion, and customer retention, and drive your SPA REVPATH. Premier Software gets to the ‘Core’ of your business. The industry’s leading spa business management software companies has confirmed as a key speaker at an exclusive one day event held at the Microsoft Gulf, Gem Auditorium, Internet city, Dubai. 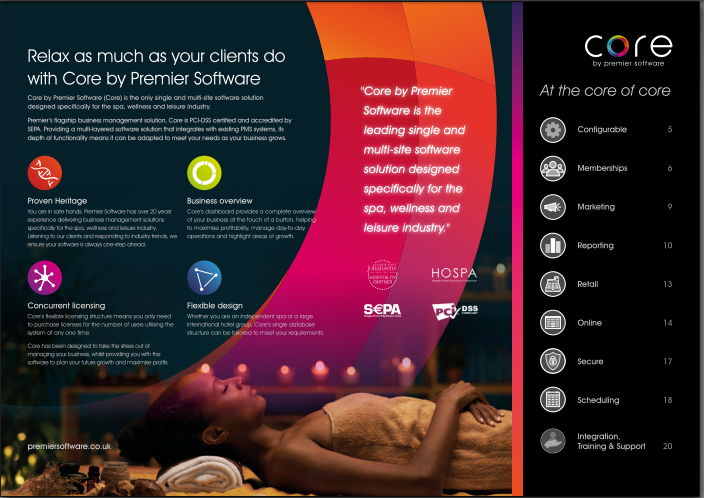 Premier Software has teamed up with Deyafa Hospitality Solutions to host an exclusive event showcasing its flagship software system – Core by Premier Software (Core). 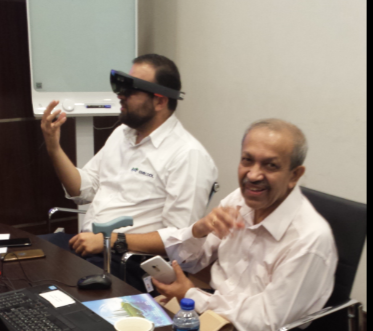 The event is supported by Microsoft and Synergy Software Systems,. Developed specifically for the spa, wellness and leisure industry, Core is already the software system of choice for many leading hotels and spas across the world including the Buji Club – Burj Khalifa, InterContinental® Dubai Marina, Nikki Beach Resort & Spa, The Belfry and The Corinthia. Core brings together over two decades of experience to deliver a business management system that provides a complete overview of your business at the touch of a button. Core is available both as a single site, and a multi-site solution. Stephen Jones, Director, of Dubai’s Deyafa Systems will present a key note speech on spa challenges and opportunities in the region that encompasses: economic, demographic, statutory, and technological changes, key spa metrics and industry trends. The event will also showcase the Core solution with a live demonstration. We will also hear about some implementations of Core, in prominent spas. There will be opportunity to mix with other regional spa professionals at the event. Core is rapidly proving to be the software system of choice for the industry. By January 1, 2018, it is expected that value added tax (VAT) will be applied at a rate of 5 per cent on most goods and services in the UAE and wider GCC region. The Unified Agreement, previously referred to by the working title of a framework agreement, is an overarching agreement that will be concluded by all six GCC nations. The best acronym, albeit long, is “GCC UAVAT”. The unity referred to in the GCC UAVAT is a unity of purpose. The GCC UAVAT is intended to make sure that VAT is introduced in the GCC in a coordinated fashion. It does not necessarily mean that each national VAT law will be identical, nor that those national laws will all become effective on exactly the same date. The rate of VAT has been confirmed at 5 per cent, a figure that was agreed at GCC level in mid-2016. Minister of State for Financial Affairs Obaid Humaid Al Tayer. Speaking to reporters after a joint press conference with Christine Lagarde, Managing Director of the IMF in Dubai, Al Tayer said 100 food items, health, education, bicycles and social services would be exempt from VAT. Further information was provided by the Bahraini information affairs minister, who held a press conference attended by the under-secretary for finance in Bahrain. The Bahraini minister confirmed that basic food and other consumer commodities, medicines and medical supplies will be exempt from VAT. The list of exemptions signals a clear intention on the part of the GCC authorities to temper the mildly regressive nature of VAT. VAT is an indirect tax applied at every stage of the supply chain, the end effect of the levy is on consumers who finally pay the tax while buying a good or service. Businesses collect and account for the tax, in a way acting as a tax collector on behalf of the government. A business pays the government the tax that it collects from the customers while it may also receive a refund from the government on tax that it has paid to its suppliers. The net result is that tax receipts to government reflect the ‘value add’ throughout the supply chain. VAT is said to be a “self-policing” tax because of the netting-off of input tax from output tax at each successive stage of the production and distribution cycles. Thus, administration is not confined to the national tax authority. As taxable entities, VAT-registered businesses also have administrative responsibilities. Work must be undertaken in that important regard. There are four important stakeholders in this VAT episode: – governments (beneficiary), businesses (tax collectors), consumers (taxpayers) and consultants (VAT experts). VAT is a tax on consumption. It is ultimately paid by the consumer, in other words “the public” in some shape or form. The public does, therefore, need to be aware. The businesses that are required to collect the VAT and deposit it with the government are the most worried . They will have to perform an extra function, which could result in additional hiring and costs, or risk of fines, although they do not receive a direct economic incentive. It is not just a question of simply collecting and remitting, , being in the ‘middle’ may bring several complexities. if the UK and EU VAT regimes are anything to go by, the complete legislative picture will comprise a number of layers. All businesses in the UAE will need to record their financial transactions and ensure that their financial records are accurate and up to date. – Businesses that meet the minimum annual turnover requirement (as evidenced by their financial records) will be required to register for VAT. - Businesses that do not think that they should be VAT registered should maintain their financial records in any event, their turnover may change, and the in case the government tax team may need to establish whether they should be registered. Details of the Tax Law will be made to the press and details will be published on the Ministry of Finance website. The primary source of information regarding the UAE VAT Law is the Ministry of Finance website. There may be some special rules on VAT for organizations such as government entities as well as refunds available in some circumstances, especially where international obligations require us to make those refunds. Everyone is urged to fully comply with their VAT responsibilities. The government is currently in the process of defining the exact fees and penalties for non-compliance. If you’re a VAT-registered business you must report the amount of VAT you’ve charged and the amount of VAT you’ve paid to the government on a regular basis. It will be a formal submission and it is likely that the reporting will be made online. If you’ve charged more VAT than you’ve paid, you have to pay the difference to the government. If you’ve paid more VAT than you’ve charged, you can reclaim the difference. VAT differs from sales tax which is only imposed on the final sale to the consumer. This contrasts with VAT which is imposed on goods and services and is charged throughout the supply chain, including on the final sale. VAT is also imposed on imports of goods and services so as to ensure that a level playing field is maintained for domestic providers of those same goods and services. Not all businesses will need to register for VAT. In simple terms, only businesses that meet a certain minimum annual turnover requirement will have to register for VAT. That is, many small businesses will not need to register for VAT. The specific conditions (such as minimum annual turnover) that will help identify businesses that do not need to register for VAT are not expected to be announced before October. Four-step guide to help companies in the UAE to prepare for VAT implementation, (which can take between eight and 12 months). It may take longer if some of the activities are outsourced, for example IT. •	Complete an impact assessment to understand VAT and its commercial effects. •	Prioritise issues and prepare for implementation. •	This is a key step. •	The assessment looks at its various effects on the organisational, operational and financial levels. •	Typically, an impact assessment needs between eight and 12 weeks to complete and that leaves a relatively short time, no more than nine months, to affect implementation. •	Prepare a project plan and secure the necessary internal and external resources and ensure the stakeholders in the business are informed. •	VAT is not just a finance project. It affects all transactions and so touches every aspect of the organisation. •	VAT affects IT systems, finance, human resources, legal teams and even inter-organisation transactions. •	IT systems are integral to the process because they need to be updated to handle the VAT. •	Preparation will entail a cost that companies will need to budget. •	Based on the impact assessment, they need to develop a road map for identifying the changes required, understanding the scheduling requirements and planning for work. •	Implementing the changes across various levels in the organisation starts with mapping the transaction footprint to understand the VAT obligations of the business. This should form the basis for making changes across different verticals in the organisation such as IT, supply chain and human resources. •	Businesses need to design the systems and reports and train their staff on the process requirements for VAT. •	Businesses must implement necessary changes to systems, controls, reporting and governance in good time. •	Businesses need to register for VAT . •	They need to test that their business systems are capable of compliance and reporting. •	Businesses need to integrate the changes made into the operations and train relevant staff about their new roles and responsibilities to achieve the desired result. •	Testing the VAT system, processes and controls during a “live” phase (expected from January 1, 2018) is important to allow for the complete and accurate completion of the first VAT return. •	Make sure to test adequate volumes of data – e.g. processing a quarterly Vat return on all sales and purchase transactions may involve a lot of processing for some companies. •	Make sure to test interfaces. Salus Patient Relationship Management on Microsoft Dynamics CRM from Synergy Software Systems, U.A.E. Its about, 360-degree patient interactions and leveraging technology to streamline processes and workflows across an organisation to ensure that each patient is efficiently placed to the appropriate level of care each time, every time. patient’s needs, interactions, care steps and wellness plans. streamlined and questions are quickly answered. communicate health professionals throughout their care. - Established standard co-ordinated procedures across your organizations. - Automate communications, enabling uninterrupted patient care and follow-up. physicians, exam room, surgical facilities, etc. for weight loss, diabetes management, or smoking cessation to target demographics. - Stay up-to-date keep up with healthcare practices and procedures. requests, and invoicing with the integration of a financial package. - Manage internal resources services via dashboard, portal, and communication capabilities. - Track employee training and skill development. - Outlook maintains up-to-date data. - SQL server enables complex MI reporting to be undertaken. - Third-Party Dynamics CRM adapters with a multitude of options/integrations are available. - Import and incorporate data easily from legacy systems. - Comprehensive auditing and control on activities within the solution. Windows Azure via CRM’s flexible web portal framework. - Ability to develop and to test customizations in an isolated, non-production online environment.